Being on vacation does not mean leaving your favourite hobby aside. If you’re a golf lover, then Mauritius is the perfect vacation spot for you. Resorts around the island offer you access to golf courses along with a multitude of facilities. There are also resorts that cater specifically to the sport of golf with impeccably kept golf courses in the most beautiful settings. Most of these golf resorts provide its guest with complimentary golf packages, including green fees, range balls as well as various golf resources. Additionally, several of the golf resorts around the island offer learning opportunities to apprentices through integrated golf academies. Even if you’re an absolute beginner the PGA (Professional Golfers’ Association) specialists will be able to help you hone your skills. 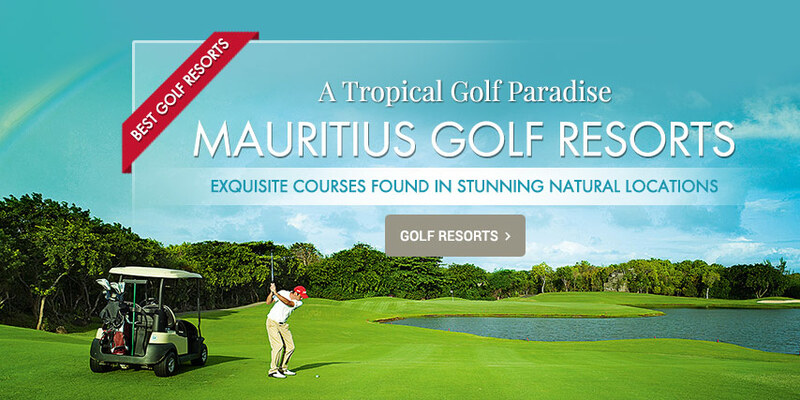 Mauritius offers you a tropical golf paradise, just a few minutes away from your hotel. Experience a new way of playing golf in splendid areas of lush tropical vegetation meandering through its inland forests. The exceptional golf resorts offer you several excellent golf courses equipped with premium amenities in a magnificent tropical backdrop; ideal for nature lovers who would love to play day in and day out. It is a great opportunity for friendly get-togethers, family activities and even for informal business meetings. Golfers at all skill levels can enjoy these golf courses as well as the most demanding professional players. There is a great laid-back vibe and feel-good nature on all these exquisite courses found in stunning natural locations. Come experience these unique golf courses where you will feel a special connection between your favourite game and the wonderful environment, without having to abandon the comfort of your lush resort for too long. Live the authentic Mauritian charm with the lavishly-designed accommodation featuring garden, sea or golf views suites equipped with fully fitted kitchen, dining areas and a generous veranda with a private step-up plunge pool. You can also experience the luxurious villas which come with high quality amenities such as large dressing, safe, designer bathroom, walk in shower, double sinks, bathrobe and many more. Featuring up five-bedroom elegant villas and located along the golf course between holes No. 1 & 9 in a 213 hectares tropical garden, The Anahita Golf & Spa Resort offer the ultimate tropical luxury! Wellness Center: 8 single treatment rooms& 1 double treatment room with own garden area, interior and exterior showers. 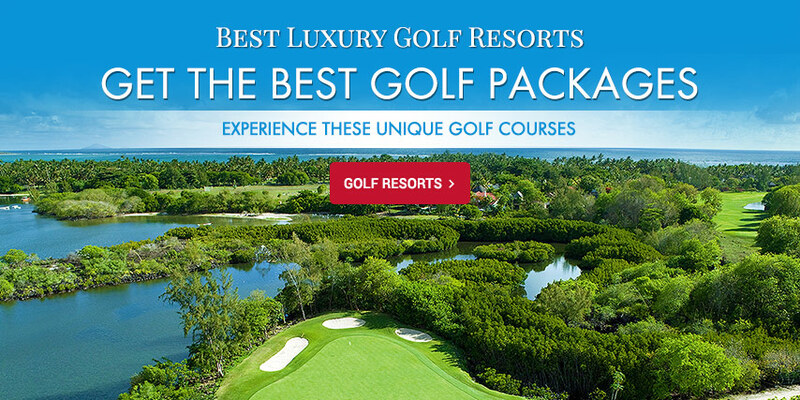 Play a full 18-holes golf course and perfect your game at the Anahita Golf Course, designed by Ernie Els & Bernhard. Ernie Els is one of the world’s best golfers holding more than 50 victories worldwide including three Major Championship titles. The golf course includes green fee & 55 practice balls. Golf Cart is applicable with a supplement. The Anahita Golf Course features large fairways and five sets of tees. Six stunning oceanfront holes culminate in a final shot that is among the most spectacular in the world. Built to USGA standards, it is the first of its kind in Mauritius. One hour of golf initiation is also offered every day to Resort’s guests at 11 am. Carefully woven into the tropical sanctuary, the course is set against lush mountains and fringed by a vast crystal-clear lagoon. Awali Heritage Golf & Spa Resort is the ideal place to seek refuge for a luxurious experience of pure relaxation in the midst of nature with the perfect combination of the bewitching African heritage. This all-inclusive resort is ideal for families looking for a fun packed holiday for high spirited children and teens. Adults can relax in the Seven Colours Spa, including a wide offer of massages and treatments. The Awali also offers its clients access to the Frérica Nature Reserve, 18-hole golf course, C beach club, and other recreational activities such as wind surfing, snorkelling, private beach, table tennis, archery, and giant chess. 6 baby nurses trained in first aid and childcare. Guests at the Heritage Awali Golf & Spa Resort have access to the premium golfing facilities at the Heritage Golf Club, a shared facility between all Heritage properties, with a splendid 18-hole championship golf course. Practice your shots at this masterpiece of a golf course, designed by the famous South African architect firm Peter Matkovich and Hayes, which stretches over 100 hectares featuring both an 18-hole course par 72, and a 9-hole course par 3, a putting green, a chipping green and a driving range. The diversity of landscapes with hilly terrain, small lakes and streams offer the residents and visitors to the Domaine an unforgettable and an immensely enjoyable golf experience. Heritage Le Telfair Golf and Spa is situated in the heart of Domaine de Bel Ombre. Member of the ‘Small Luxury Hotels of the World, Heritage Le Telfair boosts a stylish elegant colonial architecture exuding the ambiance of grand tradition properties for a stay tailored around fine dining, personalised service, and exclusive spa facilities. At the resort, families can enjoy spacious and stylish accommodation with unparalleled sea views and direct beach access. The elegant setting is adorned by colonial inspired design. The resort proposes an array of amenities and facilities for children with the aim of making holidays for families as enjoyable as possible. Kid’s Club facilities: Fitness classes; sport classes; initiation to golf; dance classes; mini culinary workshop; mini golf; evening programmes. Guests at the Heritage Le Telfair Spa & Golf Spa Resort offer guests the chance of practicing their golf skills at the Heritage Golf club, a club found on the Domaine de Bel Ombre premises, shared by other Heritage properties such as the Heritage Awali Golf & Spa Resort and the Heritage Villas as well. The golf course was designed by the famous South African architect firm Peter Matkovich and Hayes and stretches over 100 hectares featuring both an 18-hole course par 72, and a 9-hole course par 3, a putting green, a chipping green and a driving range. The diversity of landscapes with a hilly terrain, small lakes and streams, offering residents and visitors to the Domaine an unforgettable golf experience. This eco-friendly golf course has the only Footgolf course on the island, along with a club house and a golf academy with PGA certified professionals. 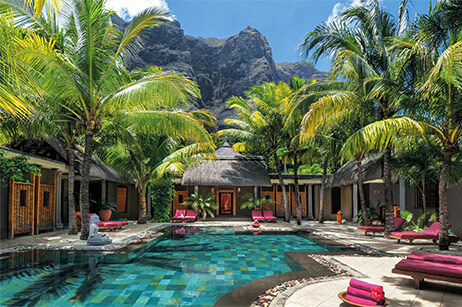 Situated on Le Morne peninsula, Beachcomber Paradis Golf Resort & Spa stands against the UNESCO World Heritage Site of Le Morne Brabant Mountain. The resort is fringed by a wonderful lagoon on one side and a spectacular golf course on the other. It is one of the greatest leisure resort in Mauritius, offering superb accommodation in rooms, suites or private villas fringed by a pure white sand beach and the island’s largest lagoon. The luxurious beach resort offers an ideal choice of accommodation for golfers, families and honeymooners. Le Paradis Golf Resort & Spa is adjacent to Dinarobin, a neighbouring Beachcomber hotel of the same category. Both resorts share their facilities and create undeniably, one of the island’s greatest attractions in terms of quality and variety. There is a nightclub for adults, while children can be entertained at the Paradis’ mini-club. Access to other golf courses: Heritage Golf Club; the Tamarina Golf Estate; Avalon Golf Estate. Unforgettable is the only word to describe a round of golf on the course at Paradis. Set against the backdrop of majestic mountains, the fairways and greens curl along the shoreline of a spectacular bay. 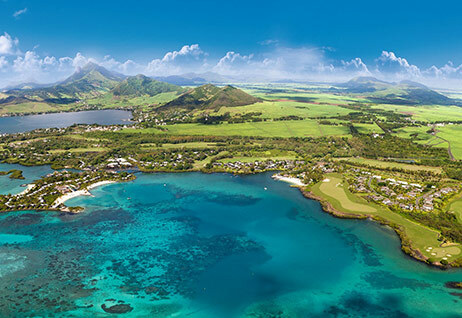 The claim that this is one of the most beautiful golf courses in Mauritius is a valid one - built within the resort’s grounds, between the iconic Morne mountain and the crystal-clear lagoon of the Morne peninsula. Much of the creative design of the bunkers and fairways is attributed to international golf legend Tony Johnstone who has spent several years playing the course through its many evolutionary stages. The course is a pleasure to play and offers a challenge to all. The smooth green fairways are dotted with the bright colours of bougainvillea, flamboyants, poinsettias and araucarias, while the royal palms, filao and coconut trees complete the tropical island style. Choosing the right grass to suit the climate, the greens are planted with Seashore Paspalum, an ideal turf for the tropics. The Tamarina Golf & Spa Boutique Hotel is a 4-star boutique hotel, located on the west coast of Mauritius, not far from the picturesque village of Tamarind. With an outstanding design, top chef dining and friendly high-end personal service, this formidable boutique hotel gleams proudly as one of the most exotic properties on the island. Their charming rooms are decorated in ochre and warm orange tones and furnished with wood, raffia and rattan, designed to embrace the local architecture with high-end amenities. The only boutique hotel with its own golf course - 18-hole championship course. With a practice area, changing rooms with showers and lockers, a bar and restaurant, a pro shop, an academy with courses offered by a PGA professional, equipment rental and more. Preferential access to the Casela World of Adventures leisure and theme park. The hotel provides a free shuttle service to the park twice a day. Acacia Spa - Intraceutical oxygen infusions, face and body treatments, semi-permanent manicures and pedicures, bathing rituals and aquatic therapy, as well as yoga classes. 6 restaurants and bars - Wine gallery with grand vintages and more affordable wines from every corner of the world, including France, South Africa and Latin America. Animation - performance of live musicians during cocktail hour. Land activities: 2 tennis courts; fitness room / gym (as from November 2016); pétanque; yoga on the beach once a week; board games; reading corner; a weekly introductory golf class; beach games; bicycle rental (for an additional fee). Sea activities: Surfing lessons; stand-up paddle; kayaking; kite surfing; dolphin watching; scuba diving; deep sea fishing; water skiing; glass bottom boat rides. (a surcharge applies). Each hole offers five different tee-off points: Professional, Competition, Member, Senior and Ladies’. Dinarobin Hotel Golf & Spa features as one of the best hideaway luxury hotels in Mauritius because of its stunning scenic shoreline and tranquil paradisiacal location. 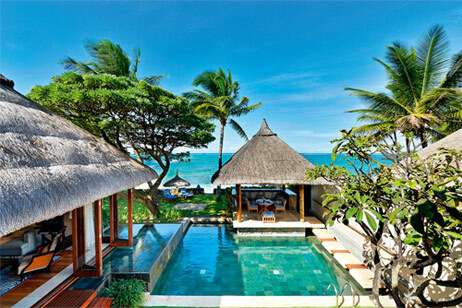 Its 172 inviting rooms have a balcony and some offer views of the Indian Ocean. Each suite has a modern bathroom stocked with free toiletries. The hotel’s villas offer a heated private pool and a 70m private beach; a personal chef and private butler are at the disposal of guests upon request. Food lovers have a choice of 8 inventive restaurants for a variety of dining experience. Restaurants offer tantalising international cuisine, including mouth-watering seafood. And those wishing for refreshing drinks can access to the bar which opens until sunset. This quietly upmarket sanctuary offers you soul soothing tranquillity at its Clarins spa, where you can find massage rooms, Ayurvedic area with 2 cabins and meditation deck; 2 saunas; 2 hammams; heated swimming pool. There is also a fitness room dedicated for personal training and 5 swimming pools for relaxing times. A magnificent suite and villa-only resort, the Dinarobin Hotel Golf & Spa offer guests the possibility of enjoying an extremely relaxing holiday while still being able to practice their favourite sport at the excellent Paradis Golf Club. 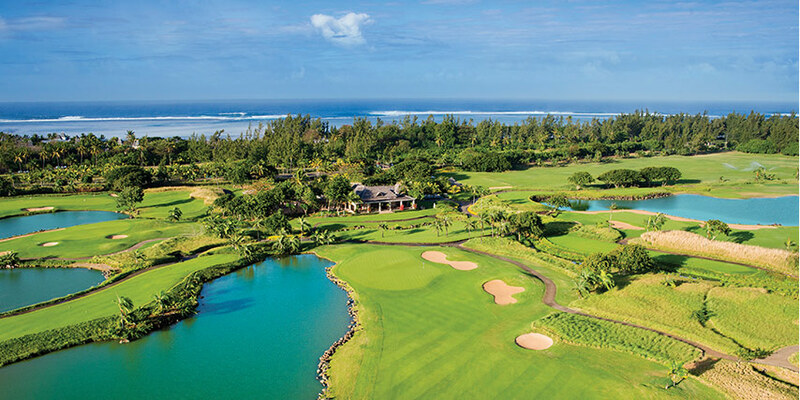 The claim that this is one of the most beautiful golf courses in Mauritius is a valid one - built within the resort’s grounds, between the iconic Morne mountain and the crystal-clear lagoon of the Morne peninsula. Much of the creative design of the bunkers and fairways is attributed to international golf legend Tony Johnstone who has spent several years playing the course through its many evolutionary stages. The course is a pleasure to play and offers a challenge to all players. 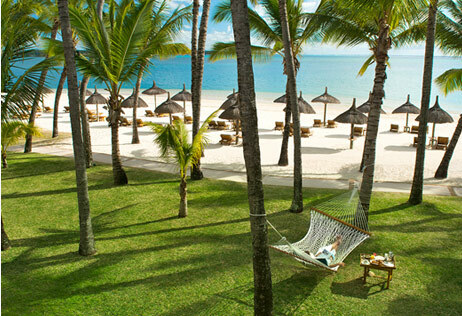 Constance Belle Mare Plage is a 5-star hotel with exquisite restaurants, an array of sea and land activities to choose from, and first class premises for a stay in the lap of luxury. It won the title of best Luxury Golf Resort at the World Luxury Hotel Awards. 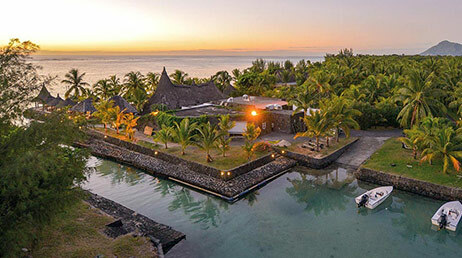 Featured among one of the top luxury brands in the world, the Constance Belle Mare Plage resort is an elegant property located in the eastern coast of Mauritius amidst a 15 hectare of tropical lush garden. Kids can have some fun moments with children of their same age at the Constance Kids Club which caters for kid aged between 4-11 years old. Parents can rely on the caring hands of the fully trained and enthusiastic coordinators to lead trips of island exploration, local crafts courses, culinary activities and scavenger hunts, to name a few. Discovery will be a key part of each daily theme. 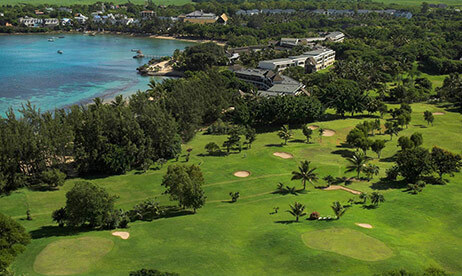 The Legend Golf Course is Constance Belle Mare Plage’s first championship golf course set along one of the most beautiful beaches in Mauritius, opened in 1994. This splendid 18-hole golf course laid in the heart of an indigenous forest has been designed by the South African champion Hugh Baiocchi. This excellent course is perfect for professional players and beginners alike. You’re sure to have a very pleasant time and experience on this course built as per the USPGA specifications with terrific Tif Dwarf grasses. The resort disposes of a golf academy; perfect for you to polish your existing skills or develop new ones. The instructional program is designed to fit in with your daily program, to avoid inconveniencing you in any way. Constance Le Prince Maurice is a 5 star deluxe hotel set within 60 hectares of unspoilt private land in the middle of the lush vegetation of the tropical gardens at Poste de Flacq. The hotel is among the world leaders in luxury hospitality. It was awarded the best Luxury Hotel with the Best Scenic Environment for the region at the World Luxury Hotels Awards. In a totally secluded area, the hotel offers luxurious and contemporary accommodation featuring suites and villas with excellent amenities. Find yourself in the realm of rejuvenation at the Spa de Constance with Sisley for aromatic treatments combine with massage rituals, and local traditions. Guests can have access to a pool and poolside bar, tennis courts, water sports, kid’s club, and shops. Relish the local and international cuisine with the excellent and reputed restaurants. The newly refurbished Shangri-La’ Le Touessrok Resort and Spa is an upscale private hideaway strung along the white-sand beach and turquoise shoreline in the eastern coast of Mauritius. This 5 Star resort delivers tropical elegance in a blissful setting adorned with palm fringed paths which lead to tropical gardens complimenting with the Mediterranean style villas dotted around the beaches - an ideal destination for luxuriously fun holiday for family and friends where you can indulge in thrilling water and land activities. Just off Le Touessrok’ pristine shore, you will find two paradisiacal islands- Ilot Mangenie which is open exclusively to Shangri-La’ guests and features a trendy beach club and on-island butlers - and Ile aux Cerfs, which holds a spectacular 18-hole championship golf course that was designed by the famous pro-golfer Bernhard Langer. Guests of Shangri-La can benefit from a wonderful golfing retreat on an 18-hole championship golf course situated on the beautiful island of Ile aux Cerfs, off the east coast of Mauritius. The fantastic course here allows for a range of golf experiences that can be enjoyed by just about anyone; whether you are looking for a fun activity to enjoy with friends, or just want to brush up your golfing skills, this terrific golf course will not disappoint. You will be able to enjoy spectacular views as you fine-tune your chipping and putting techniques. So, come enjoy an exceptional round of golf at one of the most exotic championship golf courses and create beautiful lasting memories. The world class Four Seasons Resort Mauritius is one the top classy holiday destinations located in the eastern coast of Mauritius. The Resort is beautifully manicured with its stunning and sophisticated 136 villas and residences lavishly designed to meet the expectations to the most discerning guests. Sip a luxurious lifestyle with the stunning villas, alongside their private pools which offer incredible nature views. These well-appointed accommodations are filled with natural lights, and decorated by contemporary wood and stone accents. Besides, the high standard accommodation the resort is renowned for its Golf Club nestles in a tropical sanctuary with a backdrop of the awe-inspiring mountain ranges. Additionally, the resort offers you exquisite culinary experiences with its eclectic range of restaurants from the finest Mauritian and pan-Asian delicacies to fresh seafood, classic Italian dishes and a contemporary grill. 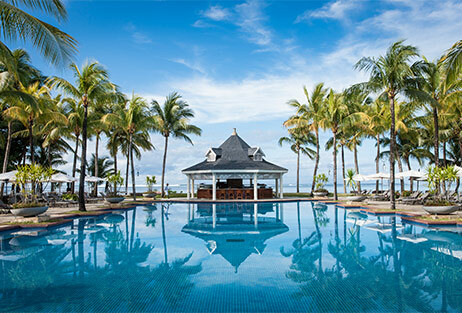 Four Seasons Resort Mauritius’ guests have unlimited, complimentary access to the Four Seasons Golf Club Mauritius at Anahita that can easily be accessed by a 5-minute transfer in a golf shuttle, (available upon request at the front drive). It is an 18-hole golf course with putting and chipping greens and a dedicated Four Seasons Golf Academy offering high-end equipments and premium services - the academy provides computerised swing analysis with professional guidance to help improve your game and also deliver daily, complimentary initiation classes to beginners. The Anahita Golf Course features large fairways and five sets of tees. Six stunning oceanfront holes culminate in a final shot that is among the most spectacular in the world. Built to USGA standards, it is the first of its kind in Mauritius. Located in the incredible peninsula of Belle Mare, in the heart of a 60-acre tropical garden, along a beautiful sandy beach, One & Only-Le Saint Geran hotel is the perfect retreat for guests seeking luxury accommodation and amenities in an elegant setting. The peninsula is situated near the site of Le Saint Géran shipwreck which was immortalised in Bernadin de Saint-Pierre’s novel Paul et Virginie. The hotel architecture reflects the Mauritian influences. The iconic colonial-style hotel features its 162 spacious suites and one villa consisting of private terrace or balconies facing with great views of the ocean or lagoon, whilst the back door opens onto a tropical garden. The bathrooms are beautifully appointed, and are designed with great cascading showers. Designed by Gary Player, the 9-hole golf course of the Saint Géran possesses large fairways of kikuyu grass, the ideal tropical grass. Located near the lagoon, it is relatively flat and surrounded by a park consisting of more than 5,000 coconut trees. Its 9 holes are agreeable to play regardless of the weather. Combining technic and relaxation, in a friendly atmosphere, the Saint Géran Golf Course allows seasoned players to challenge themselves and beginners to polish their play. This course is friendly and simple to play on, even if you are not staying at the Saint Géran hotel. 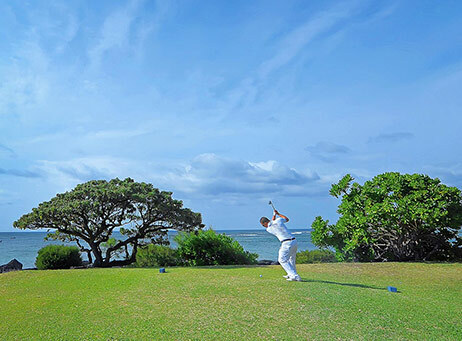 Resident golfers will also benefit from an agreement passed with the Constance Belle Mare Plage hotel granting them to play the Links Golf Course, an 18-hole renowned course and designed by two champions: Rodney Wright and Peter Allis. Shandrani Resort & Spa is a feast for the eyes and hosts state-of-the-art facilities, making it a hub of stylish serenity. Fringed by three beautiful, separate beaches, each offering a different breathtaking scenery, Shandrani appeals to adventure seekers and mellow travellers alike, with its extensive choice of sports and recreational activities. The resort is perfectly tailored for families with extensive options of accommodation; from a range of suites to family apartments and rooms, and a dedicated Kids’ club with compelling activities. There is plenty for everyone at Shandrani, make sure to make the most of it. A sailing school and a diving centre affiliated to PADI will delight all sports enthusiasts. Shandrani’s 9-hole Par 29 “pitch and putt” golf course spreads across 768 metres. The golf course runs adjacent to the beach, offering breath-taking views over the ocean. Shandrani’s golf course is a fantastic asset that complements the outstanding facilities offered at the resort. The small size of the course makes it the perfect option to improve your short game but will offer a challenge to beginners or seasoned golfers. With the tee-off just 100 metres from the Reception and the beach, this course is both stimulating and fun. One of the renowned German chain of hotels, the Maritim Resort & Spa is ideally located in the vast tropical nature park- the Maritim Estate in Turtle Bay. This site harbours magnificent sites such as the ‘Historical ruins of Balaclava’, a national monument part of the historic heritage of Mauritius, the Turtle Bay Marine Reserve and its diverse fascinating marine life and the gorgeous Citron river’s waterfalls. Exhibiting all the pleasures of a tropical island hotel resort, each of the 215 stylish rooms, suites and exclusive villa has a private sea view balcony or terrace on the Turtle Bay coastline. The Maritim Resort & Spa Mauritius offers you a wonderful selection of restaurants and an infinite range culinary delights, from international to local cuisine from buffet to exquisite ’à la carte’ restaurants from relaxed to refined atmosphere, be spoiled by choice! Designed by the renowned Australian professional golf player Graham Marsh, the Maritim Golf Course is a rather unique combination of 9 holes (PAR 29). The Maritim Golf Course is perfectly designed for any golfer to play. It offers a tremendous variety in length elevation and angle and a wide range of shots&hephil; an excellent opportunity to practise various levels of skills during your stay at the excellent Maritim resort. Whether you’re to play at a beginner’s level or practising level for advanced, this course will suit all your needs and you will assuredly have a great time here. 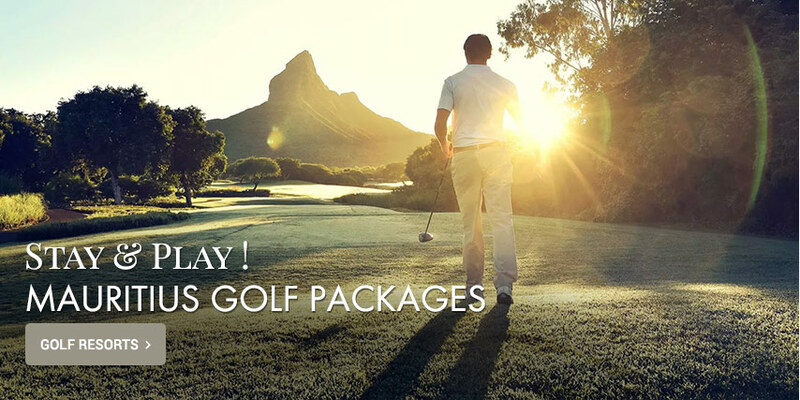 In addition to these hotels having their own golf course, you will find in Mauritius hotels not having their own golf clubs or courses, but still they do offer their guests exclusive discounts in various golf courses on the island. By doing so these hotels offer their guests to enjoy the golf facilities of neighbouring resorts while ensuring minimal travelling time via the hotel free shuttle services, or having advance booking privileges along other golf benefits and services. Guests also have the advantage of special discounted rates on golf packages, unlimited complimentary green fees or for having a free use of golf amenities on the different golf courses. A stay at Shanti Maurice will give you complimentary access to the Heritage Golf Club, located at a short 10-minute drive away from the estate. Superbly conceived, the course’s combination of complex terrain and accessible holes helps to provide an experience for players of all ages and abilities. Come enjoy an exclusive experience on this stunning golf course, very carefully designed by South African architect Peter Matkovitch, with passion and love. With its 25 treatment rooms, the award winning Nira Spa is built around an enchanting tea pavilion, lily ponds acts as a revitalizing spot- an ideal retreat vacation indeed! All Long Beach guests have free access to the Ile aux Cerfs Golf Course. 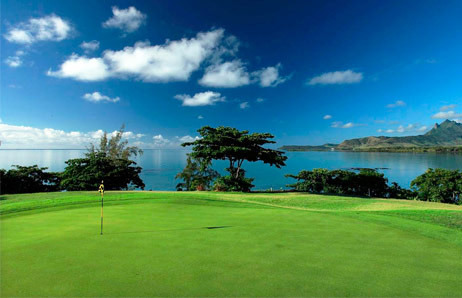 It is renowned to be the most picturesque golf course in Mauritius and can be reached by a private boat in 10 minutes. 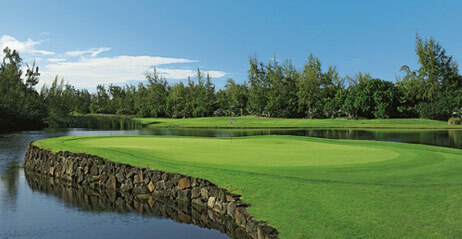 This 18-Hole par 72 championship golf course in Mauritius was designed by the famous golf Champion Bernhard Langer. It has a superb Golf Academy and high-tech equipment that allow players to take lessons with the aim of perfecting their game. All 18 holes of this island golf have views of the ocean - some with glimpses across clearings through the trees; others by coming close to the shore. Expansive white sand bunkers and water set off the natural backdrop of trees and vegetation perfectly. There are nine lakes in all, and three of the holes require tee shots across sea inlets to the fairways. The course has been designed to challenge advanced players as well as to remain exciting and playable for recreational golfers. The luscious turf is Salam Seashore Paspalum grass, which is resilient in the tropical climate and allows the highest standards of course conditioning. 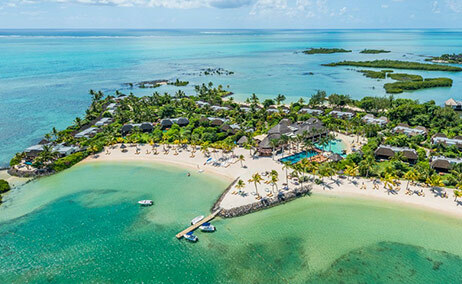 Ambre Resort & Spa is located minutes away from one of the most beautiful golf courses in the world - the Ile aux Cerfs Golf Club. 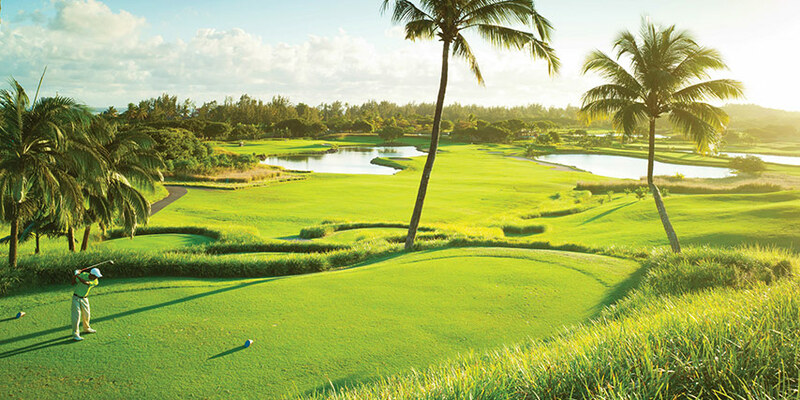 This golf course represents a unique “island” golfing experience surrounded by a shimmering turquoise lagoon. Bernhard Langer designed this 18-hole championship golf course of extraordinary concept and flawless execution which has been described as a ‘wonder of the game’. This course is an excellent opportunity for any golf enthusiasts to test and hone their golf skills. Staying at The Residence Mauritius offers guests the opportunity to benefit from an unforgettable golfing experience at the 18-hole par 72 Ernie Els-designed Anahita golf course. It is one of the island’s premier golf courses. The Anahita Golf Course features large fairways and five sets of tees. Six stunning oceanfront holes culminate in a final shot that is among the most spectacular in the world. Built to USGA standards, it is the first of its kind in Mauritius. Carefully woven into the tropical sanctuary, the course is set against lush mountains and fringed by the vast crystal-clear lagoon. 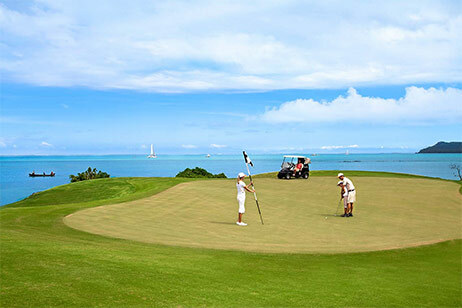 As a guest of LUX* Grand Gaube you’ll have the excellent possibility of indulging yourself with fantastic golf experiences at The Links Golf Course, Belle Mare Plage and the Ile aux Cerfs Golf Course. The natural setting of the Links Golf course is nicely complemented by excellent fairways and firm greens. It is perfect for both beginners and professionals who wish to challenge themselves a bit; water hazards across 6 holes make for many challenges and provide a unique golfing experience. The Ile aux Cerfs Golf Course, located on its own beautiful island, Ile aux Cerfs (“Deer Island”), is an 18-hole, par 72 championship golf course that provides fun and challenges to both professional and amateur golfers alike.